The final round of the Sahara 58th Senior Men’s National Boxing Championship and there was more than just the title of ‘National Champion’ up from grabs. While Commonwealth Games super heavy weight champion Paramjeet Samota was looking to claim his fifth consecutive title, promising Assamese pugilist Shiva Thapa was aiming at winning his first gold at the National Championships. Gold medallist at the inaugural Youth World Amateur Boxing Championships, Nanao Singh was looking to reclaim the title after missing out last year due to a hand injury. Like their champion boxer Samota, the Railways Sports Promotion Board was also gunning for their fifth consecutive title. The Services team on the other hand was hoping to break Railways winning streak. So there was lot at stake for boxers and teams alike. The fight for the super heavy weight title was the last bout of the day, but it was worth the wait. Up against the 2010 Commonwealth Champion and the Asian Games bronze medallist Satish Kumar of the service gave a brilliant account of hisagility and skills. The 22 year old boxer from Uttar Pradesh was not deterred by his opponent’s international status. Satish started aggressively and stole the show in the first round scoring nine points as opposed to Samota’s six. The jolts seem to wake giant up from his sleep. The second round witnessed some intense action, with both the heavy weights going all out and scoring seven points apiece. In the final round though Samota, the burly 23 year old came around and hit the pedal to the metal; with some heavy duty combinations he won the round (19:9) and with it the bout. The five time national champion said, “My strategy was to go slow and wear out my opponent and go all out in the third round, I played according to my plan and it paid dividends. This is my fifth consecutive gold and very happy with this accomplishment”. Nanao Singh also capped of a brilliant performance with another scintillating victory in the final round of the light fly weight division against Pankaj Saini of Punjab. The 2009 Asian Championship silver medallist never let the Saini come in shape. Right from the start of the bout he kept the pressure on his opponent with his swift movement and effective left and right jabs. Nanao went on to reclaim the National Champion title with a score of 14:6. It was an emotional victory for the 20 year old from Manipur, who had to sit out most of last year with injury problems. He expressed, “Last year was a difficult period for me with the hand injury, but this year I have done well on the domestic circuit and hope to carry on the form and make it big in the international arena”. In the bantam weight class, there was nothing stopping the nimble footed Shiva Thapa. Thapa, a gold medallist at the 2011 Belgrade Winner tournament, was at his menacing best as he trounced local lad Maniknandan V. Maniknandan’s feat of overpowering 2010 South Asian boxing champion Chhote Lal Yadav in the semi-finals, was not given any respect by the by the 18 year old wunderkind. He powered through to his first Senior National Championship gold medal with a 13:6 win on points. It was a fight to the finish for the yellow metal in the fly weight category. Silver medallist at the recently concluded Tammer Tournament in Finland, Madan Lal of IBF exhibited and excellent blend of grit and determination. The reigning national champion started off slow against Sunil Kumar of the Railways. He was down a two point deficit after the first two rounds of play. But in the final three minutes Madan launched a counter offensive to which Sunil had no reply. With hard hitting body blows and hooks he managed to level the score before taking the lead. In the end the 20 year old was able to defend his title and take the gold with an 8:7 victory on points. “Sunil was not an easy boxer to beat, he is fast and has a solid defence. I kept my composure and waited till the right moment to make my move and it work very well. 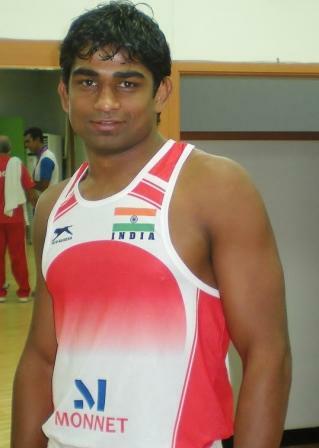 I am very happy with my performance in the tournament”, stated Madan after his medal winning bout. In the light weight class Olympian Diwakar Prasad hammered Vijay Kumar of Haryana with an inspiring exhibition of high class boxing, which enthralled the audience. The WSB boxer of the Venky’s Mumbai Fighters was in exceptional touch and completely dominated the proceeding with his in and out game. He won the bout 19:9 on points and with it the gold medal. Railways bagged their fifth title on the trot with 3 gold medals, 1 silver and 2 bronze. Services came in second with 2 gold medals, 1 silver and 4 bronze while the IBF team brought up the third spot. Sahara India Pariwar, the largest sports patroniser in India, has consistently and effectively been providing support for the Senior Men’s National Boxing Championships over the years. The Pariwar has worked in close proximities with the Indian Boxing Federation to identify and nurture boxing talent in the country. The corporation’s consistent and long-term assistance has helped a great deal to enhance the popularity and awareness of the sport, leading to more youngsters taking boxing up as a profession. Mr. Abhijit Sarkar, Head of Corporate Communication, Sahara India Pariwar said, "Sahara is happy to be associated with the Boxing Federation of India. National Championship is a melting pot of talent and provides future boxing champions to the Nation and that is the primary reason Sahara has specially chosen to patronize the event"
Monnet Ispat and Energy Limited the team and kit sponsors for the Indian Boxing Team, has provided constant corporate support to boxing tournaments in the domestic circuit. The Monnet Group has been partnering the IABF with an aim of getting the country's athletes to the top of the Olympic podium. Mr Sandeep Jajodia, Managing Director & Chairman of Monnet Group stated, “With the brilliant performances from our 4 Olympic qualifying pugilists after the highly successful campaign at the world Championships, this particular tournament has generated special interest amongst all of us to wait with baited breath on the performances of boxers in the other 6 wt categories. I believe that pugilists like Shiva Thapa and ParamjeetSamota have it in them to qualify for London if they continue their performances that they have given today. It was heartening to watch some of the other boxers especially Nanao Singh slug it out for their quest of National glory”.